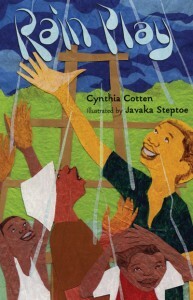 Rain Play by Cynthia Cotten is a rhyming poem about playing in the rain. It has a great, tall format with absolutely gorgeous cut paper illustrations by Javaka Steptoe that manage to be bright and joyful even when depicting the bad weather. A group of kids are playing at the park when it starts to pour. Rather than run inside immediately, some of them stay out to splash around in puddles. But when the lightning comes, it’s time to go home. This is a great book about something that all kids love to do. I still remember that feeling of heading home from the park or from school in the rain and walking extra-super-slowly so I could jump in puddles, look at the way the water changed everything, and enjoy how quiet and shiny everything sounded. I think kids will find this book exactly describes how they feel about the rain.